When you’re shopping for a high-performance blender, you’ll likely find yourself comparing two well-known brands, Vitamix vs Blendtec. These are the top 2 brands in America and both have a long history of having the highest quality, best customer service, and most powerful blenders. This is a comparison that many others have had to make before purchasing their new blender, and it can be a little confusing. Both manufacturer’s offer the best blender money can buy, and they are all priced moderate to very expensive. This article will highlight the differences between each company and help you decide which is the best fit for your needs. Horsepower: Who Has the Most? What Kind Of Blender Do They Use At Starbucks? How much power does a Vitamix use? What kind of blender do they use at Jamba Juice? Blendtec released a new entry-level model blender for 2018. It belongs to their Classic series and is called the Fit. A full write-up is coming shortly and I’ll post a link here. Blendtec released another blender to compete with Vitamix’s Ascent Series. It’s a beautiful blender with the typical high horsepower motor. A full write-up is coming shortly. In October 2017, Vitamix released a new line of blenders called the Explorian Series. The first blender in that line is the model E310. The Vitamix E310 is very similar to the other full-size blenders Vitamix sells, and is very comparable specs wise to the Classic Series (C-Series) such as the ever popular 5200 (with the low-profile container). What is significant about this model is the price point. 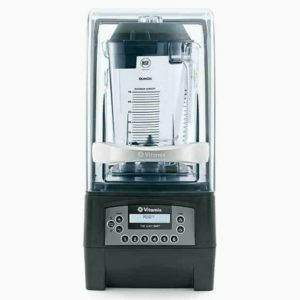 It is now the new low-price leader for Vitamix and rivals the pricing of many of their Certified Reconditioned models. Multi-Size containers: The Ascents come with a standard full-size 64 oz container. But it can also be fitted with single serve sized containers, much like you get with a Ninja blender. So one blender base can be used like a traditional blender with a full-size container (like the 7500) and can also be used with a single-serve sized container (like the S30). Self-Detect Sensing Technology: The motor base has the ability to automatically detect the size of the container you are using and will then adjust the program settings and maximum blending times accordingly. Warranty: All Ascent blenders come with a 10 year warranty! As mentioned above, Vitamix changed to a 10 year warranty as standard on their Vitamix Ascent Series of blenders when buying brand new. We’re not aware of any other changes to warranties offered by Vitamix. On the other hand, Blendtec made a change on their Certified Refurbished blenders. They shortened their standard warranty on Certified Refurbished and they now only come with 3 years of warranty. Their brand new blenders still come with 8 year warranties and 10 years on the Professional 800 and Tom Dickson Extreme. The winner in 2018 for the Best Blender On A Budget is a tough one as both Vitamix and Blendtec make excellent blenders that will blend any ingredient thrown in them. 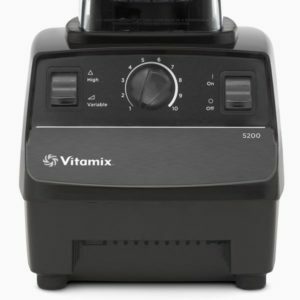 Vitamix has really stepped up their game to compete at this entry level price range with their new Explorian E310 introduced in October 2017. And Blendtec has introduced their new Blendtec Fit as a direct competitor at a fantastic price. There is no dominant blender in this decision. They each have strong features in different categories. If price is the #1 deciding factor, both the Blendtec Fit and Vitamix E310 blenders constantly battle each other for the lowest price. And depending on what month or day you check, one may be lower than the other at blendtec.com or from Vitamix.com directly. Check prices at both to be certain of the best price. If you plan to blend thick ingredients most of the time, the Blentec has more HP, but the patented Vitamix tamper will be a huge timesaver and probably the best reason to buy the Vitamix Certified Reconditioned Standard Programs blender. If there’s no sales at the time of purchase, the Blendtec Fit will be the cheaper buy. We could just say it’s a draw and both are equal. But we feel there should be a winner picked. If you’re comfortable with refurbished blenders, the Blendtec Total Blender Certified Refurbished (TB621) is often a great price, and if they’re in stock, buy it! That is a terrific price for a blender of this caliber and quality. 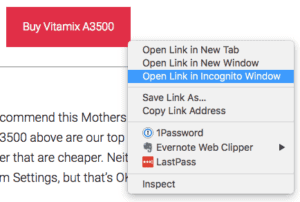 So … Our overall opinion, by a small margin, we recommend the Vitamix Explorian E310 Blender as the best blender on a budget. Value blender is one of the most competitive categories in the high-performance blender market. High power and long warranties aren’t enough to win here. Other factors such as new technologies, flexibility, and container choices all at a great price make this a super tough category to win. Based on price alone, the Blendtec Designer 650 looks to be the winner with a savings of $20 over the Vitamix A2300. But for a blender in the $400+ range, $20 is less significant than in the Budget Blender range. But if $20 makes a difference to you, yes, the Blendtec Fit is the winner. Both of these blenders are reconditioned by their factory’s, and are also great values. Both of these come with a plethora of Auto Programs and great warranties. They’re solid contendors in this category. The winner for the Best Value Blender is the Vitamix A2300. Both of these blenders are highly rated, loved by consumers and have similar prices. The Blendtec has more HP and Programs. The Vitamix is lacking Programs, and we really value Programs. So yet again, this is another challenging decision. No one blender stands out dominantly over the other. For day-to-day functionality, the Vitamix tamper rises the Vitamix Ascent A2300, along with an unbelievable warranty of 10 years, self-detect technology built into the containers, and the ability to add-on the single-serve to-go containers make it ultra versatilve. The A2300, in our opinion is the best value blender. This category is when we start to care less about the price and more about buying a top-of-the-line or near top-of-the-line model. But not buying the most expensive blender available. We are huge fans of the Blendtec Designer 725, and even own one of those in our kitchen. But judging purely on price between these two titans of blenders, the Vitamix A2500 offers a lower price. So the winner just on price is the Vitamix A2500. Yes, the Designer 725 shows up again as a refurbished model. It’s cheaper but has been fully reconditioned. This is the sweet spot of blenders and where many of our readers shop for a blender. And again, it’s a tough one, but this time there are greater differentiators. It pits several new technologies against each of these blenders. But it is our overall opinion, with the Multi-Size capabilities and longer warranty that the Vitamix Ascent 2500 be awarded Best Blender Overall. The A2500 balances value with Multi-Size flexibility. It’s like having a Next-Gen 7500 and a S30 all in one blender. The Blendtec Designer 725 is a beautiful blender with a delicious illuminated capacitive touch screen interface. And it has a very powerful motor. If you find yourself blending extremely tough foods like nut butters, this would be a better choice. The winner for the Best Blender is all about the best blender for a home kitchen. At this level, both blenders can basically make the same quality of blends. So we start looking at the smaller differentiators. And for many home cooks, noise is a big issue. This is probably the easiest one to make a judgement on. Both of these blenders are the best residential blenders offered by Vitamix and Blendtec. The Vitamix A3500 tops out at $619, while the Blendtec Pro 800 eclipses $1099. In this category, it’s less about price and more about buying the best-of-the-best. But if you were in the market to buy the best blender offered by Vitamix or Blendtec, the Vitamix A3500 wins hands down on price. At this level, there really aren’t any alternatives to consider. 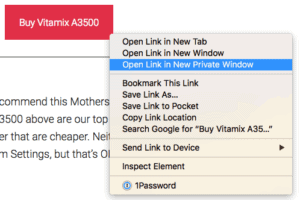 Vitamix doesn’t have Certified Reconditioned A3500’s yet, and the Blendtec Pro 800 has from time to time offered Blendtec Certified Refurbished Pro 800‘s, but they are offered infrequently. So there really aren’t any real alternatives to consider at the moment. This is where Blendtec takes some of their restaurant grade innovations and brings it into the home. If you’ve ever been to a Jamba Juice, Starbucks, or another restaurant that makes serious smoothies, you’ll notice nearly all of them have their blenders enveloped in a plastic enclosure to reduce noise. These enclosures work EXTREMELY well! With the Blendtec Professional 800, you don’t need to embed the blender motor and mechanisms into the counter like they do in many restaurants. Instead, this blender is designed for a regular home kitchen, which means it is fully self-contained and portable. So we cap off this Best Blender competition with the winner being the Blendtec Professional 800. When your blender is capable of blending an iPhone, you know you’ve got plenty of horsepower. Both manufacturer’s offer blenders with incredible horsepower! Any of the models sold by either company has more than enough power to handle the ingredients you put in—and, yes, that includes smartphones. The truth is, most people would have a tough time telling the difference between a smoothie made in a Vita-mix and one made in a Blendtec. They both produce a smoothie with a creamy consistency, and they both can heat up a soup using just the friction created by the spinning of the blades. Bottom line: you won’t miss out on much power no matter which model you choose. When comparing pure horsepower numbers, Blendtec has the slight advantage here. Every Blendtec model that discloses their horsepower number is rated at or above 3-peak horsepower. Most Vitamix blenders are only rated at 2-peak horsepower, with the exception of Next Generation models like the Professional Series 750, Professional Series 300, 7500, and Creations Elite, rated at 2.2-peak horsepower. In the horsepower battle, Blendtec is the winner. But good enough is sometimes all that is needed to provide similar if not the same results for smoothies, juice, nut butters, and the like. And they each produce food that has very similar results. Once again, the Vitamix vs. Blendtec match here is a pretty even draw. 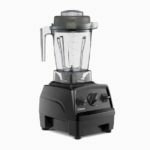 Both companies offer seven year warranties with their new blenders that cover both the blender bases and the containers for normal wear and tear. A point to note is that the new Vitamix Ascent blenders come standard with a 10 year warranty. 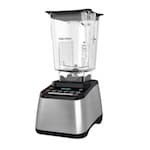 For the other Vitamix models, the 7-year warranty with the Vita Mix, there is an option to add three years of warranty coverage at the time of purchase for an additional $75, bringing the total coverage to 10 years. You can also upgrade the Certified Reconditioned models from 5 years and add an additional 3 years, getting a full 8 years of warranty. Blendtec also offers an additional three years of warranty coverage for $75 if you decide to upgrade when purchasing a new blender. We think both of these warranties are excellent, so we’re calling this round a tie. If beauty is in the eye of the beholder, then it stands to reason that this matchup largely comes down to user preference. Without question, the blenders produced by either company are quite large and bulky. They average between 15″-20″ in height, 5.75″-7.7″ wide, 7.5″-9.5″ deep, and can weigh up to 12.5 lbs. 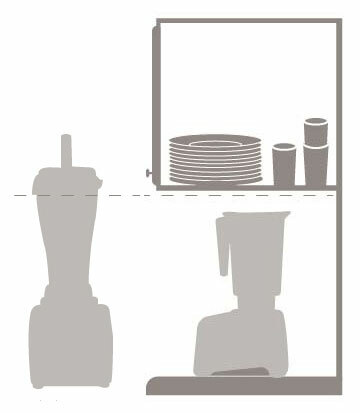 It’s important to note that the older model Vitamix blenders are quite tall due to the larger 64 oz container and the taller bases. These models are often too tall to fit under the standard kitchen cabinet if you plan on storing the container on the base. However, newer models, like the Next-Gen G-Series Professional Series 750, Professional Series 300, Vitamix 7500, and Creations Elite feature a newly redesigned base and wider, shorter containers. These newer models should have no problem fitting under standard kitchen cabinets. Looking at the latest Vitamix Ascent blenders, they’re even a little bit shorter than the G-Series. So kitchen cabinet height becomes less of a concern. Let’s not forget that Blendtec has 3 jars for their blenders. The original Blendtec Four Side Jar, the Blendtec Wild Side Jar, and the latest Blendtec Twister Jar. The Twister Jar is only 16 ounces but it is also considerably shorter than the other 2 jars and is great for someone who usually makes a thick frozen smoothie for one person. Allowing this to be your main jar freeing up lots of cabinet height room. Who wins the design battle? We have to give it to Blendtec only because they have always been designed to fit under standard kitchen cabinets. We’re not going to mince words: both blenders have some of the highest-priced models on the market. The question is: who offers the better-quality affordable options? 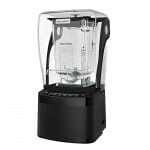 Vita Mix blenders range in price from $299 to $689 with an average price around $484. The factory reconditioned models are the cheapest of the bunch, starting at $299, but only come with a 5 year warranty. If that seems steep, consider that Blendtec models range between $279 to $1035 with an average price of about $555, which is about MSRP for their very popular blendtec tb-621-20 with street prices in the $400 range. Their factory refurbished models are their most affordable offerings, starting at $279, for the Total Blender Classic Certified Refurbished. I wish I could offer up a category of Best Blender Under $200, but there really isn’t one in a professional grade blender meant to last years and years, and blend almost anything a home cook can throw in it. In the price battle of Vitamix vs Blendtec, both Vitamix and Blendtec offer affordable units, with the lowest priced options coming from their fantastic Certified Reconditioned models for around $300. Blendtec has the edge here by offering the cheapest high-performance option, with full 7-year warranty, their Total Blender Classic Certified Refurbished. Vitamix “legacy” blenders all use a fairly low-tech dial and toggle switch setup. The controls are intuitive and provide you with precise control over the speed with the twist of a dial. The one exception would be the Next-Gen Series 780. That model was the introduction of the first capacitive touch screen by Vitamix. In 2017, the Vitamix Ascent introduced digital screens, but still rely on knobs, either manual or digital. They do offer Auto Programs on some of their models just like the Blendtec’s. 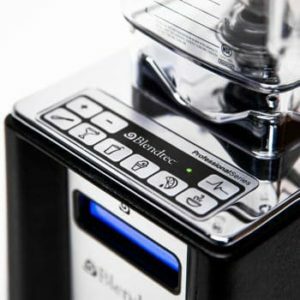 Blendtec has taken a more high-tech approach to the controls by implementing either an illuminated touchpad or built-in buttons with presets and speed controls. Many prefer the Vita-mix for its simplicity. But others are always looking for the latest in technology and are big fans of the more technical Blendtec controls. Vitamix is good for simple household recipes while Blendtec’s pre-sets can be good for when you need to handle multiple loads of ingredients—or when you just plain feel like getting fancy. In doing your research, you will find articles and reviews about the Vitamix black specks problem. This was a condition in which tiny black dots would be found in your blended drink, soup, or meal inside the pitcher. It was commonly discussed as the Vitamix black specks 5200 problem or the Vitamix 7500 black specks issue, but it had nothing to do with those particular models. Those are 2 of the most popular models, so it got a lot of attention naturally. There were even “container tests” done on new purchases to see if the one you bought suffered from the problem. Basically you poured water into your new blender container, ran it on the highest setting for a few minutes, then poured it into a white bowl. If you had the black specks problem, it was very easy to see them in a white bowl. We reached out to Vitamix to get a definitive word on this subject. Basically, this issue started in 2014 and was popularized online in 2015. Although it was deemed to be due to teflon coming from the bearing seal, and no known health risks are associated with the ingestion of Teflon, or PTFE, Vitamix made modifications to the containers that were affected by this problem and completely resolved the issue. The solution was a new seal on all full-size containers. Rest assured, Vitamix stands behind their products. As of August 11, 2015, all full-size containers coming off their production lines contain a new seal that addresses the issue. If there are any further questions or concerns about the one you bought, contact Vitamix at 800-848-2649. We stand behind Vitamix and their products 100% with zero concerns about this problem. In fact we bought a new 780 back in May without even knowing the problem was fixed in August 2015. 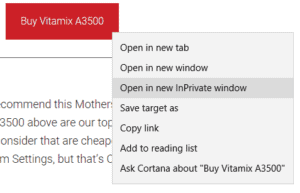 The one recommendation we do have, since inventories could still have blenders built before August 11, 2015, is to buy directly from Vitamix.com. There will be zero chance of you getting a blender without the fix if you buy direct from the manufacturer. If you’re looking for a high-performance blender, you really can’t go wrong with either Vitamix or Blendtec. Both make great blenders with excellent quality, full 7-year warranties and outstanding performance. It’s easy to see why so many people side with Vitamix. their long, storied history of quality and the simplicity of the controls make the pick of many devoted followers and the choice of so many chefs. There is much debate on which is the better Vitamix blender, the 5200 vs 7500. In our opinion, the 7500 is our #1 pick. With its updated design, shorter container, and more powerful motor, the 7500 is THE BEST Vita-mix on the market right now for the money. On the Blendtec side, the advanced, touchscreen controls and the ability to store any of their models on the countertop under standard kitchen cabinets make it a favorite of those looking for a more high-tech option. Our pick here is the Designer Series 625, with its 3 horsepower motor and flat touchscreen controls. Still deciding for yourself who the winner is in the Vitamix vs Blendtec battle? 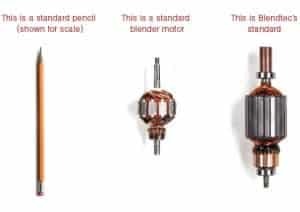 Check out our Blender Comparison Tool. It has helped thousands of people look at the cold hard facts, color choices, and pricing to make their final decision. Both of these options are also available in refurbished packages. The Certified Reconditioned Next Generation is the 7500 equivalent, and the Designer Series Certified Refurbished is the Blendtec Designer Series version. Buying a refurbished model will save you around $70 over the cost of a brand new model. You can get free shipping on a new or refurbished blender, when purchasing direct from either Vitamix or Blendtec by using our Vitamix promotion code or Blendtec promo code. If you’ve decided on a Vitamix, but not sure which model, be sure to check out our comparison on the two most popular Vitamix models, the Vitamix 5200 vs 7500. These are the highest sellers in the C-Series (Classic) and the G-Series (NextGen), respectively. If you’re undecided, or don’t want to do any more research, picking one of these two models is a sure winner. It’s very common to also compare Ninja blenders. There are lots of infomercials on TV for the Ninja, and that is often many people’s first exposure to powerful blenders that are stronger than the common $25-50 ones you see in the big box department stores. So let’s do a quick comparison. Conclusion: In the battle of the Ninja blender vs Vitamix, I’ve come to the conclusion that the Ninja, like their high powered Ninja Ultima, is a great blender that has many happy customers. It is not as easy to use, nor as powerful as a Vita-Mix, but you can get a brand new one cheaper than a Factory Reconditioned Vita-Mix. Important point to note, both provide much better results than the typical household blender and you’ll be very happy with the blended results from both. Overall, for the 5 – 7 year warranties offered by Vita-mix, as well as the ease of use, power, longstanding history of reliability and being made in America, I think it’s worth the price of a nice dinner to spend more money on a Vita-mix that I believe will last longer and be more pleasurable to use on a regular basis. Several years ago I recall seeing Blendtec blenders at Starbucks. But for the past several years, all the Starbucks I’ve been to have been using the Commercial grade Vitamix blender called “The Quiet One”. It’s an industrial grade blender with a fully-enclosed enclosure to reduce noise. Finding a place to buy one is also a bit tough as a consumer. And list price on this bad boy is $1,299.95! It uses 120v, 15 amps. You’d most likely need a dedicated circuit and breaker to make sure you can feed all the power this blender needs. Our opinion, stick with Vitamix residential blenders. Most of the Vitamix blenders are 120v, 12 amps. It’s a power-hungry piece of equipment, but luckily, they don’t run very long to make your recipes. 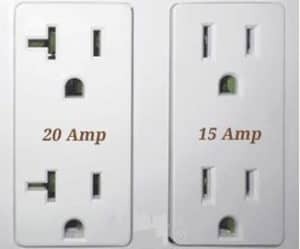 Most homes have 120v, 15 amp breakers and circuits. Unless you’re really lucky and have 120v, 20 amp breakers. I’ve only lived in one home that used 20 amp breakers to all its circuits. Either way, any of the Vitamix non-business blenders will run perfectly fine for most homes with up-to-code wiring. Worst case, you may have to turn-off other nearby appliances (ie Microwave, coffee machine, etc) when you decide to use the blender. Jamba Juice is a franchise type of business. Most if not all of the Jamba Juice stores are owned by a franchisee instead of by Jamba Juice corporation. So selection and choice is usually decided by many individuals and not one company. With that business model, you will see either a Vitamix or a Blendtec blender in that store. They will also be using one of the manufacturer’s commercial grade blenders. *Disclaimer: warranty periods and terms may change over time. As a result, at the time of purchase, please verify from the seller or manufacturer the length of warranty and it’s terms. Juicer vs Blender – Which Is The Best? Which is better: juicing or blending? I hear there’s a problem with noise on Blend Tek and Vitamix blenders. Which is quieter? Blendtec and Vitamix make commercial grade blenders, using some of the industries most powerful motors, blades, etc. As a result, yes, depending on the model, they can be quite noisy. They are louder than the typical $60 household blender, but they can blend fruits, vegetables, nuts, etc that those other blenders just can’t handle. So alot of the noise depends on what you’re blending (ie frozen fruits are really loud until they get broken down). And with these 2 manufacturer’s, you can blend almost anything. I own both a Blendtec (actually a K-Tec that got bought by Blendtec) and a Vitamix. And my personal experience has been that the Vitamix G-Series (NextGen) models have more noise abatement and is much quieter than my old K-Tec. The newer Blendtec’s in the Designer and Professional series are much improved in the noise department, but still slightly louder than a Vitamix G-Series. My recommendation, if looking for a high-performance blender, and noise is your #1 concern, the Vitamix G-Series (ie Vitamix 7500) is a great choice. If budget is no concern, then a fully enclosed blender is ideal, like the Blendtec Professional 800, which you can also get at about $350 cheaper as a Certified Refurbished model. I bought a Vitamix 6300 in August and after some use (smoothies almost 100pct of the time, and maybe use 3 days a week max) it has failed. It’s the switch beneath the unit (with the blue light. Sometimes lights up, sometimes doesn’t and only turns on rarely, which is a short in the switch. I called Vitamix, they know about this defect. I’m returning it to the seller, as I don’t have the original box and the idea of this compromised unit going back and forth in shipping after it’s only 2 months old doesn’t thrill me. I’m annoyed enough that I have to pack it up and take it to ship it (not easy on me and my schedule.) I’m going to have to look to a more reliable unit, maybe an older model or a different brand. Very disappointed in the quality. It was barely used, used correctly and I didn’t do anything like run it dry or make peanut butter. Terrific piece. Would anyone happen to know how tall the Vitamin 750 is with the 32-oz container attached? Vitamix 750, that is, of course. Bloody autocorrect. Ordered brand new S30 using coupun, but got a reconditioned product. Returned it back and customer service said they will send brand new one but still sent reconditioned one.